Ducky is efficient: it compiles the validation specification into an Abstract Syntax Tree (AST), caches this AST for potential subsequent validations and executes this AST against the passed object graph. ducky.select(config, "quux.name") // → "Three" ducky.select(config, "quux.name", "NewValue") // → "Three" ducky.select(config, "quux.2.name") // → "NewValue" ducky.select(config, "['quux'][\"name\"]") // → "NewValue"
Once again, Ducky is efficient: it compiles the selection specification into an Abstract Syntax Tree (AST), caches this AST for potential subsequent selections and executes this AST against the passed object graph. Let's define a function which should greet. 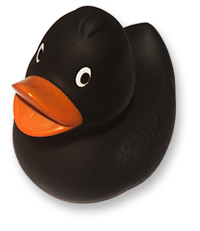 With the help of Ducky its parameter handling is both concise and strict. The parameter handling provided by Ducky support positional and named parameters at the same time. Additionally, it supports optional parameters (those with default values and not in the middle of a list of positional parameters), a powerful value validation based on ducky.validate() specifications and even the special scenario of rest parameters. Distributed as Open Source Software under MIT license.